After receiv­ing huge amounts of new snow over the past few weeks, we final­ly got a day where the sun man­aged to peak — weak­ly — through the clouds for a few hours. 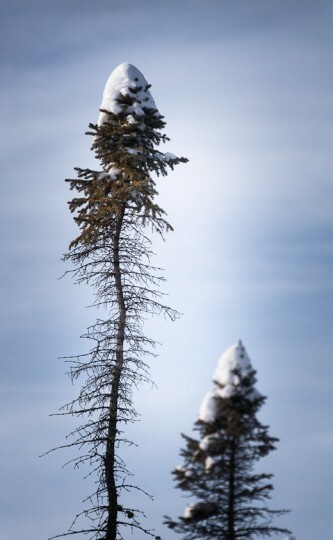 Since I was already on the west side of town, I decid­ed to head out to the Wag­n­er Nat­ur­al Area where, I hoped, the dense spruce trees cov­ered in deep snow would pro­vide an inter­est­ing pho­to­graph­ic oppor­tu­ni­ty or two. It was more chal­leng­ing than I expect­ed — the huge amount of snow often looked like just a big pile slumped over every­thing, rather than con­trast­ing or com­pli­ment­ing the forms of the trees. But a chal­lenge can be good fun, and I did get a cou­ple images that I’m quite hap­py with — I’ll share some more over the next lit­tle while. Hey Jonathan, love the shot (and of course I like the vignetting too). That first tree reminds me of a lit­tle bird with scrag­gly neck feath­ers peak­ing out of a nest. Maybe that’s a stretch, but it made me smile.